The world is certainly not without conflict. as people we all have the responsibility to be respectful to others and the power to overcome these conflicts. 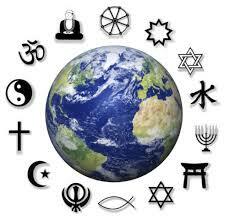 With that in mind I thought we could use today`s blog to look at some English terms used by the major world religions. Let`s start here in Japan with Shinto. and in English we use the term Shinto priest to talk about the man who officiates ceremonies at the shrine. A Buddhist place of worship is usually called a temple. Buddhist temples can look very different in different parts of the world. People who shave their heads and devote their life to Buddhism are called a monk if you are a man or a nun if you are a woman. The words priest, monk and nun are also used in Catholic Christianity. to talk about the leader of a congregation. although in Europe sometimes there are huge churches called cathedrals. and the leader of a synagogue is called a rabbi. Judaism and Christianity have a shared history and many things in common. Sometimes when talking about things that the religions have in common people use the term Judeo-Christian. Another religion that has a shared history with Judaism and Christianity is Islam. There are two main groups within Islam–Sunni and Shia. For both groups, the place of worship is called a mosque. For Sunni Muslims the person who is the leader of the mosque is called an imam. For Shia Muslims an imam is a religious leader, but also has a role in the government of a country. Hinduism is a very diverse religion that originated in India. A Hindu place of worship is called a temple. The word priest is sometimes used at a Hindu temple. In other forms of Hinduism a guru is a person who guides people in religious studies. A very customary Hindu greeting is when people say Namaste while bowing slightly with their hands clasped together. I hope that you have learned something new from this blog post. the most polite thing to do is ask a question about it. Copyright © ブライアン英会話教室, All rights reserved.